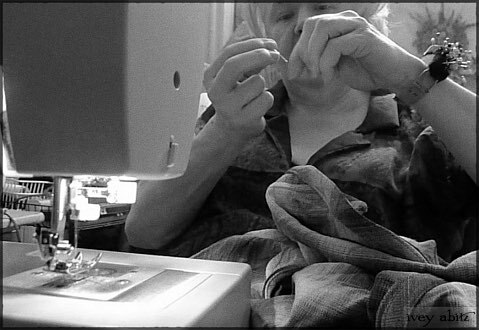 Ivey Abitz Master Seamstress, Kaye, in her sewing studio. Kaye has been with Ivey Abitz since 2009. Her desire for perfection, admiration of good design, and loyalty to Ivey Abitz has made her not just a co-worker but a part of the family. We adore her sense of humour, quirkiness, and attention to detail. 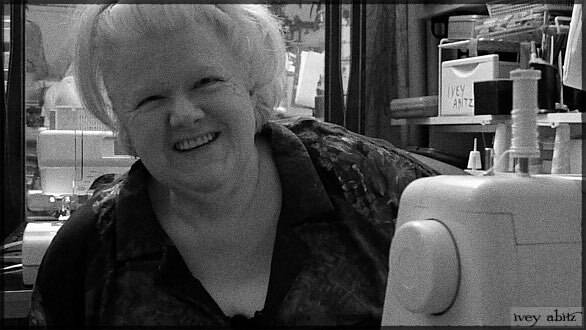 She’s one-of-a-kind, just like the garments she sews for our clients. 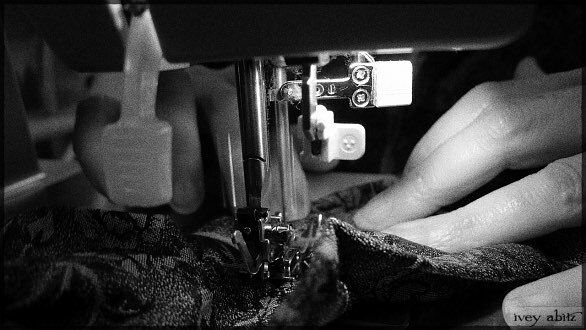 The following was taken from an interview whilst Kaye was cutting and sewing bespoke orders for Ivey Abitz in her Brooklyn, New York, studio. “The majority of my time is dedicated to doing couture work for Ivey Abitz. I know the designer and lady behind Ivey Abitz as Cynthia. I call her ‘Lady Cynthia’ because her name means ‘goddess of the moon.’ We have a friendship that has grown out of our work together. It has been nearly a decade since we connected and I began to give birth to her children (sew her designs). “When I’m done sewing these complicated designs, I’m thrilled. But getting there…it’s so involved. Because they are complicated is why I love them. You have to have a good head on your shoulders to do this kind of detailed work. 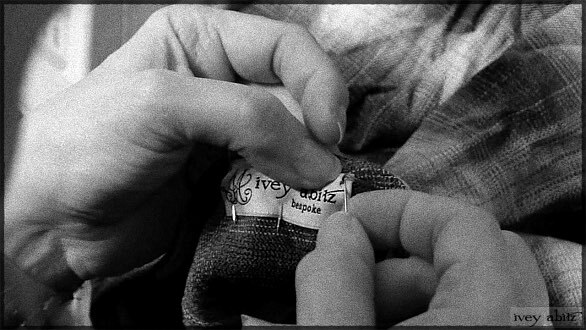 Sewing an Ivey Abitz bespoke label by hand. “I find it interesting that in this modern age of technology we have come full circle, and some are going back to the appreciation of quality and pride in workmanship. Still, there are so many companies going to foreign countries and exploiting poor people to make mass-produced stuff for a huge brand. That’s just not right. Did you like this excerpt? Buy the magazine to get the entire interview.